Thinking back to summer…was there anything you would do different? I know I certainly would, and it would be to spend more ‘enjoyable’ time outside. What I mean by ‘enjoyable’ is in an area I don’t want to leave. Some of you may be in the same place, you have a nice outdoor area, but you’re looking for that complete space. So we have complied a list of our top 3 outdoor living ideas for your Kalamazoo home! Who wouldn’t want a place to sit and relax by and hear the calming effects of the water while being able to watch the fish swim around? At the end of a long day, this is one of the most relaxing things to do…throw in a glass of wine or a beer and we’re talking heaven! On those cooler Michigan nights all I think about is sitting around a fire with some friends and family having a few drinks (is there a theme here?). Its a great way to unwind, and the kids love making s’mores too…scratch that…I love s’mores. Fire pits can be made out of the simplest material, maybe just a few larger fieldstone boulders as the ‘wall’ if your into the rustic look, or you can get more contemporary with blocks or even some flagstone propped up on an edge. If you’ve got the space and like the idea of bringing the indoors to the outdoors…a fireplace might be what your looking for. Check out one of our custom fireplace installations in Kalamazoo. We’re not just talking a basic stand a lone grill here. No, we’re talking a bit more than that. If you have a tight budget, a built in grill could be just what you’re looking for. 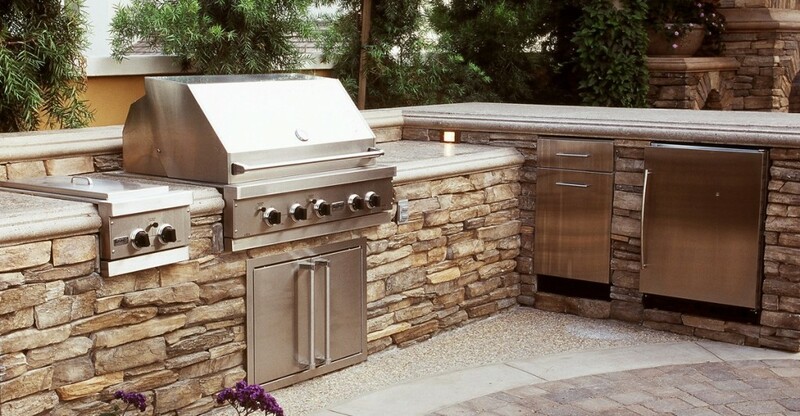 However, if your looking for a bit more, think about incorporating a wine or beer cooler, a small sink, a beer tap, a pizza oven…the possibilities are truly endless when we start getting creative with an outdoor kitchen. If you anything like me, you spend many hours in the kitchen cooking. But that’s not really where I want to be in the summer…I want to be outside cooking in my outdoor kitchen! These are just our top three outdoor living ideas for your Kalamazoo home, but we have sooo many more great ideas we could incorporate into your next design.